Welcome to the third installment of my new weekly post called My Week Unwrapped, where I talk about the games I’ve been playing this past week. There aren’t too many games to go over this time, but the lack of quantity is made up with quality! First off, I played through the deliciously creepy Rusty Lake: Roots by the developers of the Cube Escape and Rusty Lake series. Although I haven’t finished all of the previous games yet, Roots was definitely one of my favorites. While many of the puzzles were very straightforward and not too much of a challenge, I rather liked the layout, consisting of over thirty bite-sized chapters that all intertwine. Basically, you get to explore the Vanderboom family tree and help it grow, seeing each family member’s story play out. Murder, mayhem and madness abound in this bizarre puzzle adventure. Voodoo, suicide, and an immortal pet dog are just a few of the things you’ll encounter. I also found the story to be the most immersive and comprehensive of any of the previous games I played. My favorite part was the bonus content, which I highly suggest sticking around for if you decide to play it. There’s also a fantastic soundtrack that helps set the mood. It’s hard to compare Rusty Lake games to anything else, but if you’ve played any of their other works, you’ll have a pretty good idea what to expect. And if you get stuck, you can try my step-by-step walkthrough. Although I got to play The Forgotten Room ahead of release, I finished my walkthrough this week and now that it’s out, everyone else can play it! It’s a perfect game for Halloween, as you play a paranormal detective exploring a haunted house to look for a missing child. You can read more of my thoughts on the game here and make sure to pick it up if you’re a fan of Glitch Games! 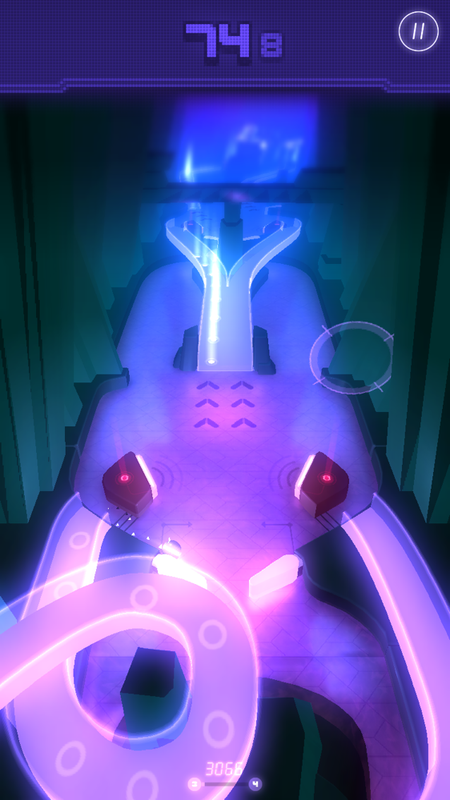 I’ve also been spending a considerable amount of time with Mediocre’s endless pinball game, PinOut. Even though I’m not terribly good at it, I was enjoying it enough to spend the $1.99 to unlock checkpoints so I can experience everything it has to offer. While it does stress me out a bit, I keep finding myself going back to it. It’s a stylish game with great music and it feels great to see my skills and score improve. And the checkpoint system is really interesting for a high-score chaser. Basically, you start off at the first zone with 60 seconds on the clock. It counts down, but you can earn extra time as you play. The idea is that you want to complete a zone with as much time as possible left on the clock. The game saves your highest time when you reach a new zone, so once you fully master a zone, you won’t have to keep replaying it — you can just start from the next checkpoint. It means I’m constantly going back to different zones to try and get a better time so I have a better chance at reaching a later zone. I’m finding that it holds my interest better than having to restart from the very beginning each time. However, I am having trouble with zone four, so I hope I don’t lose interest before I get through it. In any case, the game is free with a one-time payment to unlock the checkpoints. So give it a try! Although Haiku’s latest game, Adventure Escape: Midnight Carnival came out last week, I missed it while I was busy playing all those other games. But I picked it up yesterday and have been working on my walkthrough here. While it is a little buggier than their previous games, I am enjoying it. I like the Halloween theme of a kidnapping at a mysterious carnival. You also play as a witch who can cast magic, so that’s pretty cool! As with all the Adventure Escape games, it’s 100% free with the very occasional pop-up ad and the option to buy hints. So give it a download — you have nothing to lose. I also played some of Gazillion Games’ Dexter Slice, a remake of the old Slice game in which you need to move knives around and tap the goals without getting your fingers cut. It’s a bloody good time, and since I never played the original, it feels fresh enough for me. It’s also voiced by the actor who plays Dexter’s faith in the show, so that’s a nice touch. It is challenging, though, and even though I’m still only in the first section, some of the puzzles have required quick reflexes. You also need to use both hands and lots of fingers to get the job done. It’s kind of like finger Twister. Unfortunately, the game doesn’t have iCloud, so I would recommend playing on an iPad if you have one, and the bigger the better. I was struggling a lot more on my iPhone because it’s so hard to fit several fingers on the screen. My iPad Air 2 is a lot more comfortable and a lot more enjoyable. I’ll probably have more to say about the game next week after I’ve spent more time with it. But till then, you can watch me bloody my fingers in the video below. And finally, I finished my Puzzlepops! Trick or Treat walkthrough! If you need help with any of it, you can try my walkthrough. And that’s a wrap! I hope to see you back here next week for more! And you can see previous posts from My Week Unwrapped here. Thank you so much for doing a walk through guide for Haiku’s Midnight Castle! I really like Haiku games as they are not usually over-complicated and you don’t have to pay for stuff. I’m pretty hopeless at playing these games so your walk through guides are a lifesaver! I like the video walk through as you explain what you’re doing. I haven’t found anyone as good as you so thanks heaps! Thanks! I missed the new Haiku game too! BTW, Cell 13 which was mentioned in another of your posts is a fun & interesting game. I don’t remember Cell 13. Are you sure that was from me? but it is interesting brain game! But got The Forgotten Room, Rusty Lakes and the new Haiku game. Thanks to your posting. Oh enjoy the new iPad! 🙂 And the new games!